The Malaysian Chess Federation which is registered under the Commissioner of Sports (COS) is in the process to intergrate all states chess association to be registered with the Commissioner of Sports (COS) so they can be officially affiliated with MCF. This is important step to ensure that MCF and the states chess association have a proper and clear working structure. 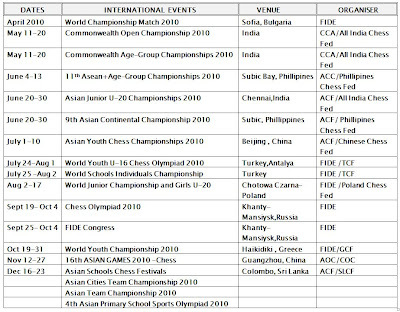 States Chess Associations registered with Commisioner of Sports under the Sports Development Act 1997. 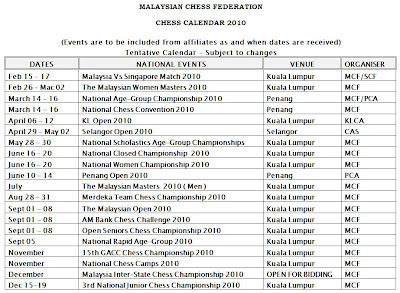 These Association is an affiliate of Malaysian Chess Federation. List of States Chess Associations that have send in their registration with Commisioner of Sports (COS) under the Sports Development Act 1997 (Pending approval ). These Association were previously an affiliate of Malaysian Chess Federation. List of States Chess Association that have not send in their registration with Commisioner of Sports (COS) under the Sports Development Act 1997. TRANSPORT COSTS OF BUS FARE WILL BE REIMBURSED TO ALL OUTSTATION PLAYERS (OUTSIDE KLANG VALLEY, SELANGOR & KUALA LUMPUR). A FOOD ALLOWANCE IN LIEU OF MEALS WILL BE PROVIDED. THE ROOM COMES WITH BREAKFAST IN THE HOTEL. PLEASE CONFIRM YOUR PARTICIPATION BY 1ST FEBRUARY 2010! AFTER THE DATELINE 1ST FEBRUARY, MCF SELECTION COMMITTEE RESERVED THE RIGHT TO REPLACE THE OFFICIAL PLACES WITH THE RESERVE PLAYERS OF THE CATEGORY. Click here to download National Rating January 2010.